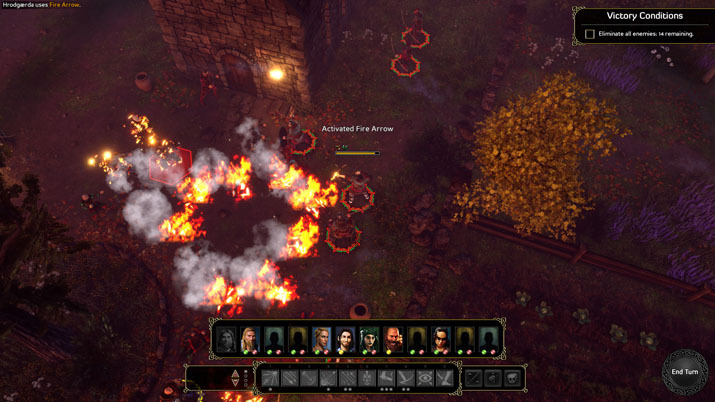 Expeditions: Viking is a turn-based RPG that takes many of the best features of RPGs since Baldur’s Gate/Pillars of Eternity and turn-based games since Jagged Alliance 2/X-COM, and combines them into an overall convincing package, inventing a new world and rule set in the process. Denmark, AD 789, a thegn’s longhouse: Your father has not returned from his last voyage to greener pastures, and you are hosting a feast to honor him. Among your guests are your mother, your friends, the jarl of Denmark, a power-mongering rival of your father, a distant cousin disputing your right to inherit, and some uninvited guests who are ready to lay claim on your longhouse right away. After talking to everyone in that longhouse the game had already piqued my interest. The portraits are detailed and expressive, the dialog and my dialog choices were interesting and varied. And the setting couldn’t be better: Secure your position as the rightful heir, strengthen your clan, defeat your political enemies, and in order to achieve all of this, set sail for England to raid or to trade – “Adventure!”, I thought, and I was right. A violent solution for every problem? The writing and the setting are the strongest area of this game, and whether or not you will love this game, depends a lot on your personal interests. If you are interested in history, the Danish conquest of England, or in Nordic myths and culture, you’ll be delighted, because this game does a very good job of re-enacting all this. For me, the game world really came to life, and I wasn’t feeling like I was playing a computer game (or running errands) for the entirety of the first chapter. And not for the absence of loot hoarding or min-max potential, what kept me totally hooked for the first half of the game was my motivation to find out more about me and the game world, which is all a RPG can hope for. Other than drama and politics, Expeditions: Viking also offers some exploring and lots of fighting, with both of these parts being well done as well. Exploration comes in two flavors: There’s exploration in the main locations, cities for example, where you start at the border of a map that is hidden beneath fog until you explore it. You may run into fights and new quests while exploring your surroundings, and for the first ten hours of this 40+ hour game, I made sure to bust every bit of fog there. The second type of exploration is on the world map, where new locations will pop up from time to time, mainly triggered by quests. Overland travel and the world map are not the strongest aspects of the game, but it doesn’t get in the way too much either. As you would expect in a turn-based RPG there is a violent solution for every problem, and in order to be a viking problem solver you need to be prepared. One way of preparing is to choose the right distribution of stat points (Strength, Endurance, Finesse, Perception, Sense) to create a proper axe, sword, bow, sling, or dagger wielding badass. Another way is picking the right skills (weapon skills, combat abilities, passive skills). Battles are fought as a group of six guys (you) vs. them, and at an early point of the game you can create new companions, so you are not restricted to pre-made NPCs. The skill system allows an extremely flexible approach to combat. Axe warriors for example can go max damage, or utility by relying on skills like Disarm (forces opponent to waste one turn, and gets rid of his shield) or Shield Hook (disables shield for this turn). There are skills like Charge, Shield Bash, Stun, Deathblow, Fire Arrow, Taunt (makes the target run towards you) and many more. 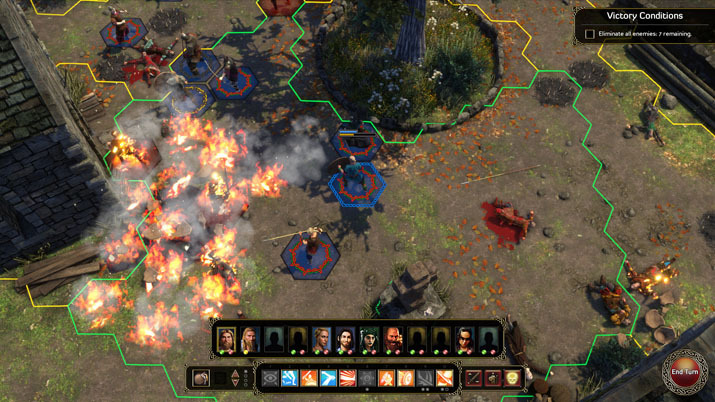 The battles are tactical, inviting the player to abuse the advantage of starting first in a turn-based battle by taunting that ironclad fortress of a man to stun him, then deathblow and/or quick shot him, taking him down before he could act. Fortunately, the same is true should the AI get the first turn. For extra awesomeness you can even use consumable items like torches, traps, tripwires, witch brews and the like, although those aren’t needed usually. Unfortunately, in practice the combat is nearly as problematic as it is awesome in theory. The biggest problem is the pacing. Many fights simply take too long. It can be fun to spend 10 to 20 minutes when fighting some nemesis after finally getting to him after a series of quests. But it can be very tedious to dispatch a bunch of deluded peasants armed with pitchforks who are cowering behind barricades, refusing to contribute. And there are bugs: Lockups, skills that aren’t working, strange behaviour of the usually competent AI, to name just a few. If the devs had found a way to activate the full potential of the skill and item system, this game could have been a new benchmark in turn-based combat RPGs. If you do what I did, ignore the bugs, and endure the occasional “filler battle”, you will find a combat system that leaves room for extensive customization and some creativity in exploring the different skill combos and their tactical application. Talking about bugs: future patches must address bugs — such as the two patches which have already been released. The release version had some rather nasty quest bugs that could lead to players getting stuck at some point with no means of advancing the main quest, which is unacceptable. In the end, the positive aspects outweigh the problems. Creating a title as complex, detailed, and varied as Expeditions: Viking is an ambitious undertaking, and it’s exactly what’s needed for gamers who don’t want to rely on “enhanced editions” of classic games to find a good role-playing experience. 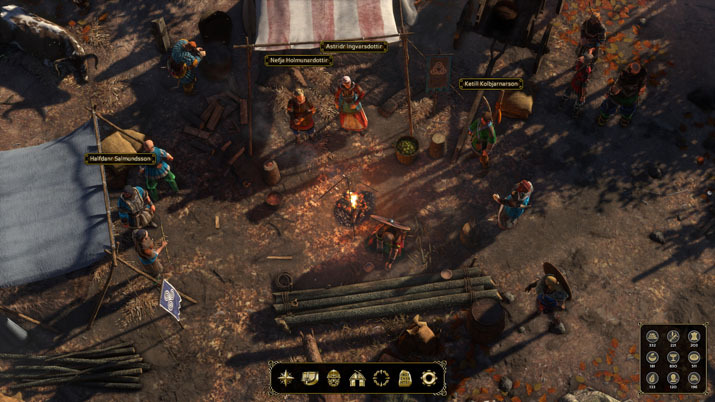 Expeditions: Viking, however, is more than just an RPG; it’s also an epic journey through history — a field with surprisingly few entries. Why rely on adventures from DnD or fantasy realms, if history can be presented in such an intriguing way?